Growing up at a summer camp I had access to the camp kitchen, and from the first moment I stepped foot in it I was fascinated. More than the stainless steel counters and over-sized equipment and canisters, I was fascinated by the cooks. All were women I could spend a day beside, watching their every move. Margaret was one of those women. She was 75 and plump with hearty forearms and a rich Minnesota accent. I was eight when I first met her and my memories of her are almost ethereal. Sometimes I wonder if she was real or just a figment who appeared to me in dreams and taught me to enjoy food. In her later years at camp she retired three times. After the first few retirement parties thrown for her she’d show up the following week unscheduled, but ready to work. Quitting the kitchen just wasn’t in her blood. 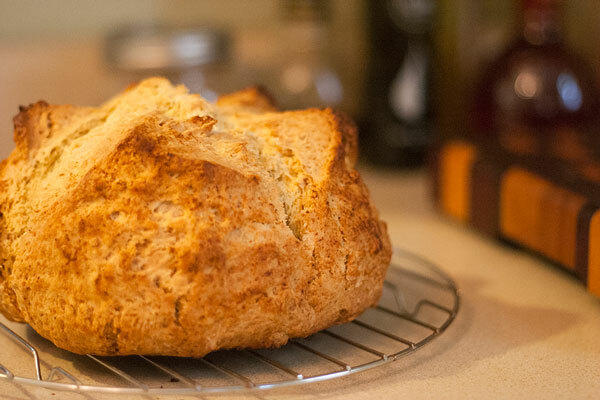 Margaret was Polish like most of our neighbors, but her specialty was Irish Soda Bread. It was a treat she made once a week for a dining hall full of campers and staff. When I first tasted this treat I didn’t understand the appeal. To me it was just a plain bread with raisins sprinkled throughout, not anything compared to her other specialties. But as I sat and casually munched on my soda bread, everyone else around me clamored for more. With one loaf per cabin group Margaret’s soda bread was a hot commodity. Deals were made throughout the dining hall on soda bread days. Since the days of Margaret in my life I don’t know that I’ve had soda bread again. 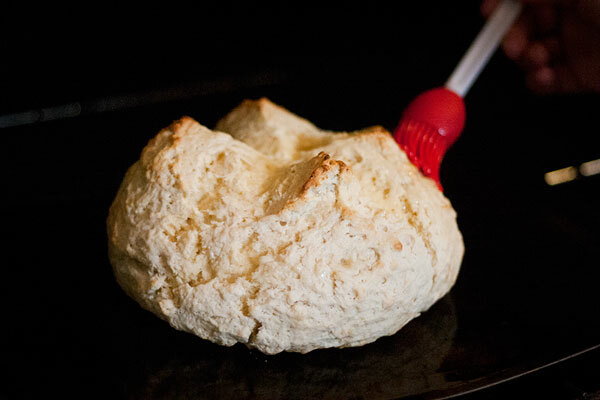 But this year, while whipping up some Guinness and Irish Cream Cupcakes, I was suddenly overcome with the desire to make some soda bread too. Finally, 20 years after my first introduction to this bread, I realize the appeal. I used this recipe from AllRecipes.com and came to the conclusion that my childhood palate just wasn’t set up to enjoy the finer things in life. Upon pulling it out of the oven this bread made my evening, my week. I’m sad I let 20 years go by before giving it another chance. I used the recipe as is, mixing it easily in my Kitchen Aid and kneading for less than a minute before shaping it into a small ball. 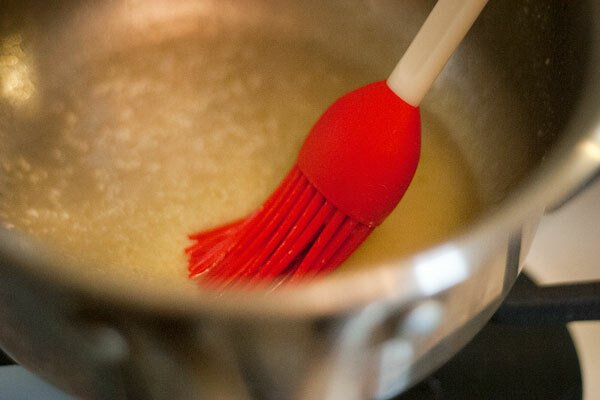 Every 10 minutes I removed the baking loaf from the oven, brushing it with a butter and buttermilk mixture. After 40 minutes it emerged golden all over and deeply browned at the peaks. The quarter-inch crust cradled the dense, delicious center. It’s a simple bread, but simple or not, I now know what Margaret went through in that old kitchen, shaping dozens of these loaves and brushing them as they baked. She took so much care to make sure each one would emerge from the oven perfectly, ready to be served to the eager campers and counselors. Very impressive. I love soda bread here, though my attempts have been a bit more slapdash than yours! And we never find it here with raisins, unfortunately! Stingy ol’ Irish. 🙂 Looks really yummy and I think this is a tradition that should stay in your family… and mine! Agreed! I was going to ask you if soda bread was a common treat there.